Every Day Is An Adventure [G1246] - $7.00 : Yarn Tree, Your wholesale source for cross stitch supplies. Cross stitch pattern from Tiny Modernist. Look at this adorable design to stitch for your camper! 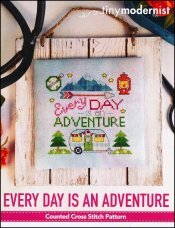 "Every day is an adventure," is stitched down the middle. Mountains, a lantern & an arrow are stitched above the saying. A camper in the woods is stitched below the saying. Stitch count 67w x 67h.